Of course I want to proudly tell the world how much I love my two little munchkins! 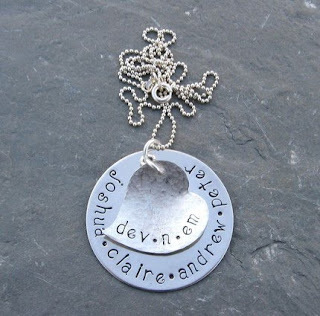 What better way than an adorable "mom" or family necklace. Tiffany posted here last November about her fabulous finds from Bloom Maternity, and that set me on the hunt for a personalized necklace of my own. Here are my latest Etsy finds I'm considering! 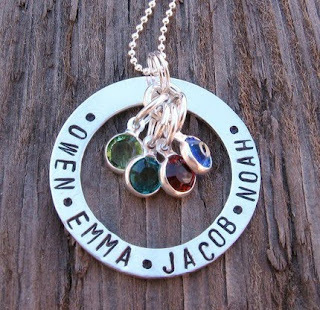 I love the birthstones, and the open shape of this one! Isn't the copper a great surprise behind the silver heart? I think this would be stunning in person! I love the idea of being able to include the whole family! You could either put you & your hubby's name on the top heart with the kids on the bottom, or your family's last name on the heart with all your names on the bottom. 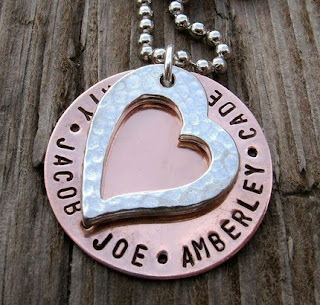 I'm leaning towards this one, cause I just love that hammered silver heart! So which one do I choose??? I say go with the copper one!! LOVE it! Check out the etsy shop "brag about it" for more cool mom jewelry.